Two homecoming concerts by rock band Muse have given a Devon resort's economy a "much welcomed" boost. All available accommodation in Teignmouth has been booked ahead of the concerts at the Den, on the town's seafront, on Friday and Saturday. Hoteliers and B&B owners said the concerts had come at an opportune time, as things were winding down after a "fairly poor" summer season. At least 10,000 fans are expected to descend on the town. 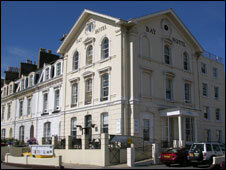 Alex Stuart, proprietor of the Bay Hotel on Teignmouth seafront, said he had been inundated with booking inquiries. "We've got 17 rooms here and we could have booked out 300," he said. "Inquiries are up massively. We've never, ever had the amount of inquiries we've had over the past couple of weeks." Mr Stuart is hosting a private party for local residents on the hotel's terrace which overlooks the Den. "We're trying to look after the locals because they're the ones who look after us all year round," he said. June Green, from Teignmouth Chamber of Commerce, said the concerts had given the town a "buzz" and brought the entire community together. She said because accommodation was fully booked, some local residents had offered their spare rooms to the tourist information office. "Even the charity shops have got T-shirts saying 'welcome to Muse' and 'it's great you're here'," she said. "There's such a sense of excitement in the town." Parking in the town is limited and Insp Glenn Mayhew from Devon and Cornwall Police said stewards would be stopping vehicles from entering the town centre unless occupants were either residents, shoppers or business people. People arriving in Teignmouth for the concert will be directed to alternative parking areas. 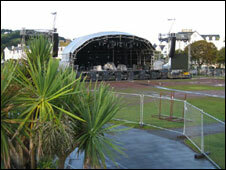 Muse, who formed in 1994, last played in Teignmouth in 1995.